I tried this flatbread at Paul Martin’s Happy Hour a few weeks ago. 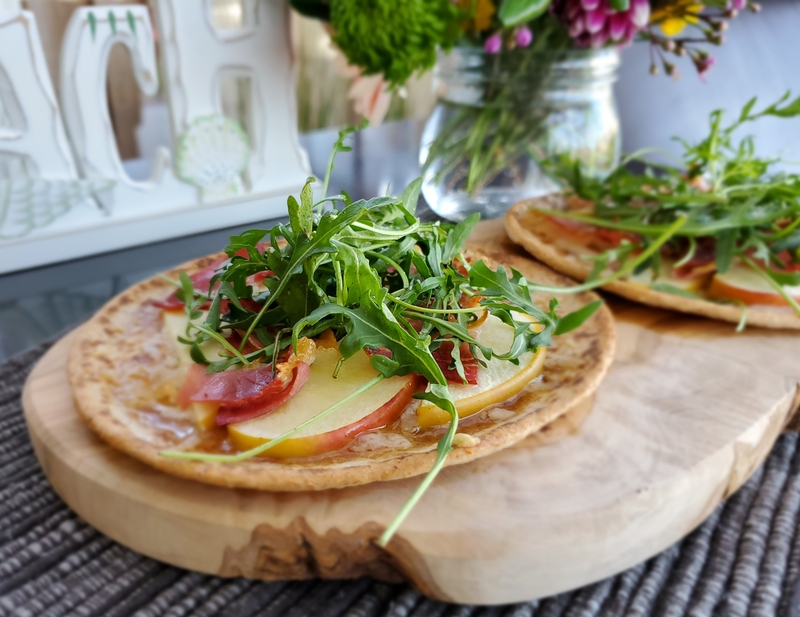 I was amazed how tasty this combo of bread, cheese, apple, cured ham, and salad turned out. I have since replicated it twice at home and added minced garlic to the combo. It is delicious! Brush the flat bread with minced garlic and olive oil. Heat in the oven for 5 minutes. Remove flat bread from the oven and sprinkle the cheese generously on the bread. Top with a layer of apple slices and a layer of prosciutto. Return the flat bread to the oven and heat for another 5 – 10 minutes. I prefer to cook the prosciutto longer. Remove flat bread from the oven and top with arugula. Sprinkle with grated Parmigiano-Reggiano and a dash of ground black pepper.